The Royal Shakespeare Company’s West End production of Matilda The Musical has announced that Hannah Selk and Zoe Simon will join Isobel Hubble and Francesca McKeown in the title role of Matilda from 19 March 2019. 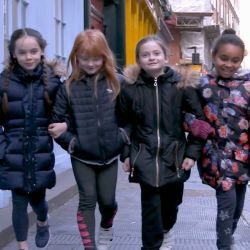 To mark the arrival of the new children’s cast, a video has been released today of the four young actresses that share the role of Matilda sampling Marcus Wareing’s new Matilda The Musical inspired menu at Tredwells restaurant. The other young performers announced today join the London company in the three teams who play the roles of Bruce, Lavender, Amanda and the rest of the pupils at Crunchem Hall and are as follows: William Biletsky, Jaden Campbell, Lottie Cook, Toby Cohen, Lucia Coleman, Leonardo Dickens, Ta’niyah Fearon-Telfer, Skye Hastie, Elliot Kelly, Angelina Li, Alexander Morrell, Sophie Richards, Ava Sawford, Bella Simmons, Cameron Sutherland, Mia White and Isaac Wiles. Toby Brandon, Tom Brown, Imogen Darwen, Darmani Eboji, Jimmy Fordham Reed, Archie Lewis, Sadie Victoria Lim and Rochelle Wyatt will continue in the roles of Bruce, Lavender, Amanda and the pupils at Crunchem Hall. Seen by over 9 million people across more than 70 cities worldwide, the multi award-winning production is currently playing its eighth year in London, booking at the Cambridge Theatre until 24 May 2020. Winner of 94 international awards including 23 for Best Musical, the hit show is now the longest running production to play at the Cambridge Theatre and is one of the top twenty longest running musicals in the West End having now welcomed over 3 million audience members in London. The RSC’s Matilda The Musical UK and Ireland tour is currently in Bradford where it’ll play until 23 March before touring to Edinburgh Playhouse (2 – 27 April), Bristol Hippodrome (7 May- 8 June), Southampton Mayflower (11 June – 6 July) and Norwich Theatre Royal (16 July – 17 August).